Hope this isn’t a jib jab. I tried a search. Glock announced the 47 for DHS. Wonder if it will eventually make it to the reat of us. Looks like 17 length slide on 45 frame. Hope this isn’t a jib jab. Ok. Please lock and delete. Did they change the magazines baseplate design? I notice in the photo that all of those in the photo the baseplate seems to have been moved forward creating a ledge. Pretty sure my old G19 mags don't have that. The base plate were extended since the cutout was deleted from these models. Per the SOW the plate needed to be extended to allow magazines to be stripped if stuck. Yep. The Gen 5 baseplates are extended a bit further than then Gen 1-4. And these G47 baseplates are extended even further than that. It's fake. Check the "Glock" logo. No slogan and no Trademark symbol (letter "R" in circle). A quick Google Image search for "Glock 47" will show a handful of pictures of the real deal. No, it's not. Both Glock and CBP have issued press releases about the adoption of the G47. And it's been confirmed by a number of current CBP officers who received notification in an agency-wide email several days ago. 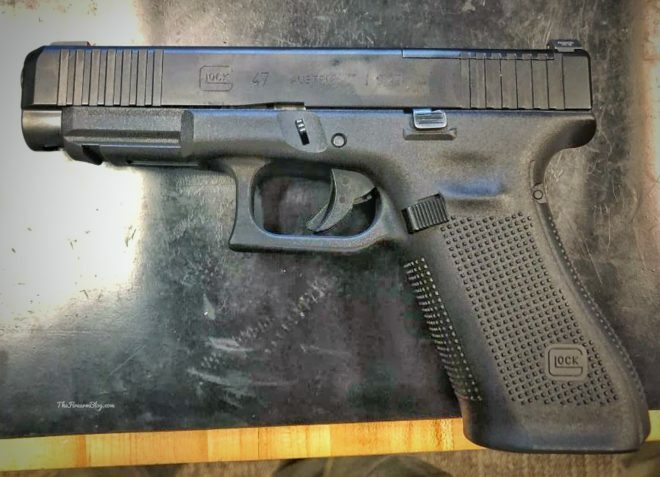 Plus G47s have already been spotted out in the wild in the hands of various CBP staff, as evidenced by the various in-hand photos now out there on the web. Check the "Glock" logo. No slogan and no Trademark symbol (letter "R" in circle). You mean this circled R at the top right of the Glock logo? BTW, that image is directly copied from an email sent out to CBP officers by the US Customs and Border Protection Law Enforcement Safety and Compliance Directorate, notifying them of the new duty handgun contract. I’m somewhat of a Glock fan but I will admit I don’t know my model numbers that well. To me the 47 looks to be nothing more than a 17 MOS with front serrations and a slightly shorter dust cover. Am I missing something? Other than being able to put a G19 slide on the G47's G45 lower to make a G45, whats the idea behind the G47, why not just use the G17. 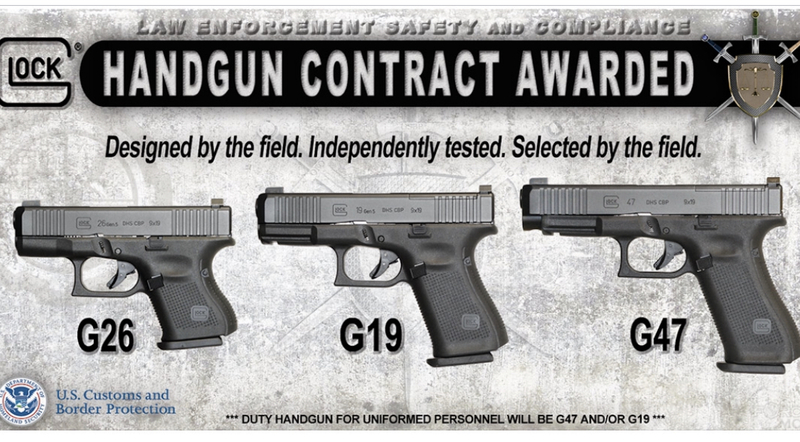 One of the requirements is modularity between the compact gun(g19) and fullsize(g47). Yep. The ability to swap the shorter slide of the mid-size gun onto the larger grip of the full-size gun was a specific requirement of the contract. The P320 is already able to do that, with the Carry grip module. The military's MHS M17/M18 is a P320 that has the option of either a full size slide or a compact slide, and uses a Carry grip module for both configurations. There is speculation that CBP's solicitation was originally written that way as an attempt to basically force the adoption of the P320. But Glock was able to produce the G47 to meet that requirement. Yes the baseplates were extended even further than the current 5th Gen magazines specifically per the CBP SOW. Who wrote that fake post? Ever had a post you wish had been written differently? There are some days you should keep your fingers off keyboards and sharp knives. 1) I usualy avoid categorical statements. Categorically stating "It's fake." is one that should have been avoided. 2) I still don't see the "R" in the trademark. Since I now know it came from an e-mail, it's probably a screen resolution issue. The blog coverage I read was dodgy. One said the CBP release stated the pistol selected was the G47...it wasn't mentioned in the release though. Another stated Glock made a formal press release announcing same. Another stated that Glock DIDN'T issue a press release because it was developed strictly for CBP and not available for the public. I still haven't been able to find a Glock release. I spend a lot of time on the Internet. Lots of fake stuff out there. When reviewing an issue I look for reliable sourcing and links that can be verified. Not much on this issue. Didn't know the original pic I posted on came from CBP sources. The pics of an actual G47 came from one of the blogs who stated they had a CBP source. With Photoshop it's hard to trust pics without some other corroborating information. If Glock is going to develop a new Pistol, it would be nice to not have to be Agent 007 to figure out what the hell is going on. This is the real Nipper signing off. Have a good evening. I still haven't been able to find a Glock release. GLOCK, Inc., a global leader in firearm manufacturing, was awarded a contract to supply U.S. Customs and Border Protection with the newest generation of GLOCK pistols after an extensive solicitation process. GLOCK is a leading global manufacturer of firearms. The simple, safe design of GLOCK’s polymer-based pistols revolutionized the firearms industry and made GLOCK pistols a favorite of military and law enforcement agencies worldwide and among pistol owners. In 2019, GLOCK celebrates its 33rd Anniversary in the United States. Renowned for featuring three safeties, GLOCK pistols offer users of every lifestyle confidence they can rely on. GLOCK, Inc. is based in Smyrna, Georgia. Looks like one only pistol!! I'll stick with my legacy Sigs!